This salad with blueberries, almonds, goat cheese and vanilla is so simple and yet so complete! It’s crunchy and it’s sweet – and I simply just love how the soft goat cheese add it all together! If you don’t have vanilla oil you can either make one yourself by adding one pod of vanilla to a jar with your favorite oil and let it stand for a few days/weeks. You can also just do it the quick (and easy) way by adding a bit of vanilla beans (1/4 pod) OR a few drops of vanilla essence to your favorite oil and stir it well together – and use right away! Start by roasting the almonds in a dry skillet over medium-low to medium heat. Cut roughly. 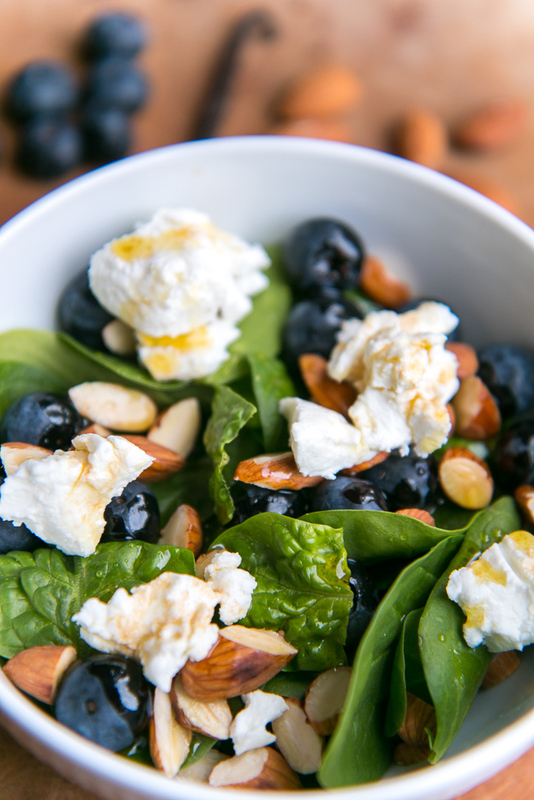 Build up your salad by adding spinach, chopped almonds, blueberries, goat cheese and drizzle with vanilla oil just before serving. Enjoy with a nice piece of homebaked bread. That looks so simple, delicious and healthy! Can you tell me what is vanilla oil? Like vanilla essence? Vanilla Oil is just an oil where you soak in your empty vanilla pods. Of course you can also just use your plain favorite oil.